As promised, I am going to be posting more details about the decluttering I am doing in our home. I know that some will find the extent that I am going with this to be extreme, but that is the beauty of this. You can feel free to take from the ideas whatever you need that will fit your own lifestyle. I am going to be posting this as a short series, one room per post, so that I can go more into exactly what I am doing and why. As I have often stated before, I absolutely loved touring an old home that was on display at a historical museum. The complete calm that I felt as my husband and I walked through the rooms was a sweet balm to my soul. The thought kept coming to me that this was the feeling that we should have when we walk into our own home. It is often stated that the family home is a place you can go to get away from the stresses of the world. Yet, how often do we allow our homes to become influenced by that stress? How many times do we fall short in that feeling of being at total peace when we walk through the door of our home? This historical home, like so many others of that time, was very sparsely furnished. The items on display were ones that spoke a story of the family’s life. When we entered the home, we were in the largest room of the house….the kitchen. Along one wall was a huge fireplace with an oven built in to the wall. In the center of the room was a large wooden table. The chairs were neatly arranged as was a long bench that ran the length of the table on each side. Items most often used were carefully placed around the room. A hutch for storing dishes, cooking utensils, and linens stood on one wall. A butter churn in a corner next to a chair. A firewood box was set up near the fireplace. There were other items as well which decorated the room, but each item held a specific purpose. Looking around, you could see that the family who lived in that home was likely a farming family. The old farm kitchen was truly the center of the home. Often times, it would be the only room to have heat in the winter. For this reason, it was the place where the family was always gathered. In many of the older Amish homes, this is still the case. Our Amish neighbors, Levi and Katie, had one large room in the main level of their 2-story home. On one end was the kitchen/dining room and at the other end was the living room. I remember how simply it was arranged and have always wanted to recreate that level of simplicity in my own home. 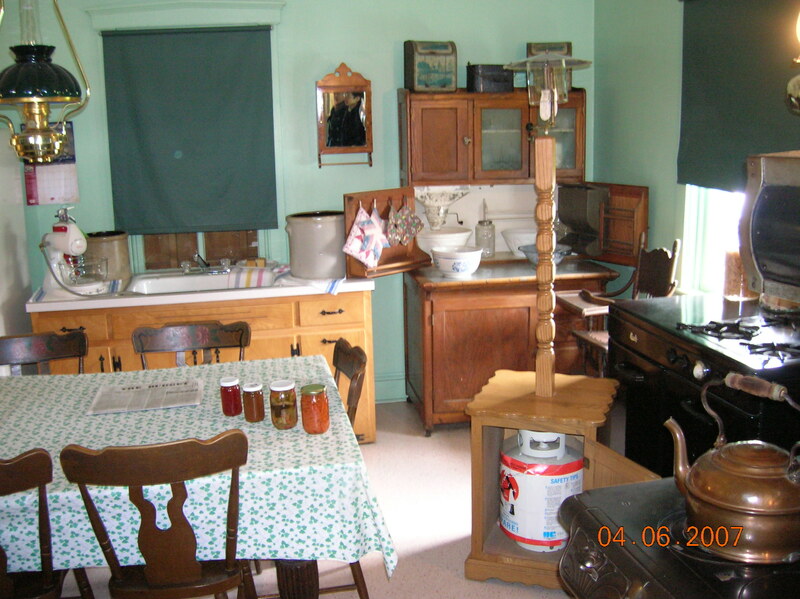 The following picture is of an Amish kitchen that I found online. I don’t know who originally took the picture, but it shows the best representation of what I love. In this picture, you can see how sparse the furnishings are. The room is small, but very functional. Do you notice the lack of cabinetry? That is typical of older homes. In fact, our home has no cabinets at all! In this little kitchen, a Momma can do all her cooking, canning, and other tasks without any problem. I absolutely would love to recreate this kitchen in our own home! Above the table is a simple oil lamp suspended from a chain attached to the ceiling. The other lighting option, which happens to be a popular one with the Amish, is propane gas lights. You can see the propane tank in the opened cabinet. These lights are just as safe to use as a camp lantern. Storing the propane bottle in the cabinet box makes it safe around children, especially with the lantern up so high from a child’s reach. A wood burning stove for heat as well as cooking makes the kitchen cozy in the winter. The gas stove provides a method of cooking in summer months when it is too hot to use a wood stove comfortably. It also provides a steady heat source when using a canner to jar up your harvest. A baker’s cabinet holds the items needed for any baking that is done each day. The family’s dishes are kept in the upper portion of the baker’s cabinet. Compared to a “modern” kitchen, this one definitely lacks the conveniences that many women enjoy today. There are no small appliances, such as a microwave or even a toaster. Yet, to the woman who cooks in this kitchen, it contains everything she needs. Extra dishes have no place in this kitchen. It only holds what is essential. Extra place settings of dishes, the canner, and other items that are not used daily may be kept on a shelf in the pantry until needed. Once the need is gone, they are returned to that location. Our kitchen is larger than the one pictured. Though it is larger, it has had it’s times of feeling more crowded than the picture above. This has been one of the driving factors in my wanting to cull out the excess. When a room in our home looks too cluttered, I get very tense. It directly impacts me. I get overwhelmed and stressed. I just can’t seem to function well in that environment. Being as I spend so much of my time in the kitchen, it is the logical place for me to start when it comes to decluttering. When I think about exactly what items I am needing in my kitchen, I take into consideration two things. First, the number of people in our family. Second, the frequency in which I use any item in the kitchen. For all practical purposes, I only need the following to make my kitchen fully functional. Additional items, such as the extra place settings, cookie cutters, and canning supplies can be stored in the pantry. I also keep the table linens on a shelf in the pantry. The items listed above are the ones that are used most often. The fact that they can all easily be stored in a single baker’s cabinet, such as the one in the above picture, is a great space saver. I don’t have a cabinet like that, but the wire shelving is more than sufficient to store it all with shelves left over. As I go through my kitchen supplies, I am finding that much can be packed away in a box. Anything in the box that isn’t needed within 6 months, can be donated. It is literally that simple. Now, I do want to mention that when you cut down your dishes to a full place setting per person, this means that you have to stay on top of doing dishes immediately after each meal. Otherwise it can be a pain in the backside to have to hurry up and do dishes so you can set the table again. Some may find that it is too tempting to go grab up the extra place settings, especially if they don’t want to run a dishwasher that is not full. In our family of four, it doesn’t take long to do the dishes if done right away. We get the wash water ready just before sitting down to the meal. My darling husband made it a house rule that each person has to clear their own place at the table and hand wash their own dishes. This makes it even easier to stay up on it. After the dishes are done, the table is wiped down so it is ready for use again. It is really just a matter of setting up a routine and sticking with it. Things don’t always go as planned, but the effort to stay on top of it is at the forefront. What I have found over the years has been that the excess “stuff” in your home can be as stress inducing as anything outside of your home. You have to maintain and store all those items. When things get too cluttered and you run out of space, the intensity of your stress magnifies as you try to cull out what you are able to do. Yet, at the same time, trying to hold on to as much as possible. In having few things, you are free from that burden. Cleaning is much faster and easier when you have less to deal with. As I go through our home and remove excess, I am finding that my personal stress level is dropping. I have more time in the day to pursue other things. By removing unneeded items, I gain space for items that we do need. Like the historical home, we want the items in our home to have purpose and function. We want to be deliberate in what we buy and keep. Though our home is much larger than what is termed a “tiny house,” we are wanting to adopt that way of thinking. As we plan the remodeling yet to be done, we are looking to open up the front of the house back to its original floor plan. The wall that separates the kitchen from the kids’ room will be taken down again. Originally, it was all one large kitchen/dining room. The pantry is a separate room just off from the kitchen. In the entry area of the pantry nearest to the kitchen, there is shelving that can easily become storage for the extra dishes and supplies. This will further leave the kitchen space more open and clutter-free. I am still working on the process of scaling back in our kitchen. It is taking time as I have to do it around my other daily tasks. I am enjoying the results though. Each bag or box of stuff that leaves the kitchen gives me a sense of relief. It has been so eye-opening to realize just how badly we let the attitudes of society to take control. In our country, people seem to have the attitude that if you have few things, you are poor and disadvantaged. Yet, I am finding that by not catering to that attitude, we are actually going to be richer in our lives. Instead of having to maintain so much stuff, we will have more time to really enjoy each other as a family. We can pursue the interests that we have without distraction. Best of all, we will save money by not getting all that stuff in the first place! It seems as though I am always looking for a better way to get my crochet and other projects organized. Lately, I have been on a binder system binge. I bought one binder to keep all the household records, menu planning, and such all organized together. I like the way that is turning out and decided to take on another area that needed to be worked on….my crochet & knitting supplies and patterns. Years ago, when I was a scrapbook and rubber stamp art instructor, I had a great system that I used for keeping track of all my supplies. I wanted to do something similar with the crochet and knitting that I now do. The first step was a search online to see if anyone else had put together a journal for their supplies and projects. I didn’t want to have to reinvent the wheel if there was a good system already out there. I was thrilled to find a free printable journal for knitting and another for crochet at Katheryn Ivy’s website. The two journals are separate downloads. She also has free printable pages for tracking your supplies, upcoming projects, and shopping wish list page for making larger purchases when taking advantage of sales. In project planning, she also offers a page for joting down notes and another for making sketches of projects that you would like to make. The final page is one that I especially love. She includes a printable chart of all the knitting needle and crochet hook sizes which can help you keep track of what sizes you already have. Armed with these free printables, I am able to put together a binder that will help me stay far more organized. I will be able to see at a glance which projects I already have purchased the supplies for. I am thinking about having the binder set up in sections. One for crochet and the other for knitting. For each of these two sections, there will be subsections using the above listed forms. This will allow me to keep the two craft methods separate. I did a search on Pinterest for crochet stitch charts and found some great printable graphs and charts that I can print off and add to the binder as well. Some of the charts I found include the cross-reference charts for US and UK stitches, stitch pattern diagrams, and a nice stitch sampler that shows & labels each of the basic stitched used in crochet. This is a great resource to have for those times when you set aside a WIP only to forget which stitch you were using. Similarly, I found some great reference charts for knitting as well on Pinterest. While I was at it, I found reference charts for making hats, slippers, and blankets sizes. For example, a head sizing chart for making crocheted hats in sizes newborn to adult can be found on the Tot Toppers website. These charts will make a nice quick reference for me to have on hand when making or planning a project. Some extra forms that I am including in the binder are: Yarn Ball band labels for those times when you lose one, Yarn Stash inventory sheets, and my own Pattern Index form to keep track of the patterns. I am looking forward to having this binder all printed out and completed. It may not help me to finish my projects any faster, but it will cut down on the number of times that I inadvertently make a duplicate purchase of my basic supplies. The journal will also be a great companion binder to my patterns binder. Currently, I have a 3-ring binder which I am storing the patterns that I have printed off from sites like Ravelry. I have them organized into categories with the first section being my WIPs.